The tyre nomination for the Spanish Grand Prix goes softer this year, with the supersoft making its debut on the Circuit de Catalunya alongside the soft and the medium. The hard tyre has always featured in the past, but this year a new surface - which the teams experienced for the first time in pre-season testing just over two months ago - has altered the complexion of the Barcelona circuit, giving it more grip but with reduced wear and degradation. And that's not the only thing that's new in Barcelona this weekend. The surface may be smoother, but the long and high speed corners remain, putting plenty of energy and stress through the tyres: the classic examples are Turn 3 and Turn 9. Wear and degradation rates will need to be re-assessed. Although the teams tried out the new surface at the start of the year, the weather was much cooler, and the cars were much less evolved. The new surface may have evolved as well. Conditions tend to be warm - sometimes very warm - during the weekend. Barcelona contains a good all-round mix of corners and loadings that emphasise every aspect of a car's performance: one of the reasons why it is a popular testing venue. The new surface has led Pirelli to reduce the tyre tread depth by 0.4 millimetres. This has no effect on performance but helps to control slick tyre temperature. 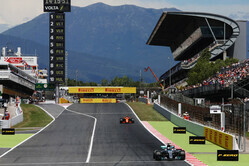 The front-left tyre is worked hardest, with Catalunya being a front-limited track. Last year, with harder compounds nominated, the majority of the field stopped twice but with a variety of different strategies: in the past, Spain has also been a three-stop race. Mario Isola: "This year, Barcelona isn't exactly like going to a new circuit for the teams: but the changes to the surface are still significant enough to alter some of the track's fundamental characteristics. We too have made a change by reducing the tread depth on the slick tyres to reduce the risk of overheating, as we will also do for Paul Ricard and Silverstone, but it's not a change that any of the drivers will notice in terms of performance or stint length. The teams already have some knowledge of the new asphalt from pre-season testing, but the weather is now much warmer, the cars considerably faster and there will also be some ageing of the surface. This year, we bring the supersoft to the Spanish Grand Prix - effectively, two steps softer than the softest nomination in 2017, as all the compounds are a step softer anyway - so the homework done in free practice will be particularly important."